Couples in healthy relationships recognize the importance of being honest with each other. But even when they're honest about their feelings, backgrounds and other details of their personal lives, some couples have a bad habit of withholding the truth about money. For some people, money is a touchy subject—regardless of who it's being discussed with. If you and your partner have entirely different ideas on how to manage household finances, or if you've had money arguments in the past, maybe you feel withholding information is better than getting into a debate. The problem with money secrets is that the innocent partner eventually learns the truth. And when they do, the repercussions can be far worse than their reaction had you been honest from the beginning. The truth is hard to admit, but keeping secrets from your partner runs the risk of losing their trust. Here four common money secrets couples keep. If your spouse has a spending problem, or if you're secretly saving up for a divorce, a savings account your partner doesn't know about might be your dirty little secret. I once worked with a lady who had about $5,000 in a secret savings account. She didn't tell her husband about the money because she didn't want to feel obligated to help pay off his credit card debt. I don't know the outcome of the story. But hiding money from a partner, particularly a spouse, indicates a bigger problem in the relationship. You have to figure out the underlying reason for the secret, and them commit to repairing the relationship as a couple. If your partner is cautious with money, but you're a big spender, you might carry a bit more credit card debt. Depending on how much you owe, maybe you're embarrassed to reveal your balance. Some people in this situation go as far as hiding statements from their partners and downplaying a problem whenever the topic comes up. Perhaps your plan includes paying down the debt so your partner never has to know the ugly truth. The reality is, you'll probably feel better after opening up and acknowledging the problem. Too much credit card debt has a negative impact on your credit score. It raises your credit utilization ratio which can drive down your score and result in credit rejections or paying more for loans. Keeping your partner in the loop prevents them from being blindsided by a rejection or higher rates when you apply for joint loans. If you reveal how much you owe, you and your partner can come up with a plan together, plus you become accountable for your actions. With your partner's financial savviness, he can offer insight and ideas for paying off the debt that you haven't considered. Working together as a couple can chip away at the debt faster. After a pay increase at work, some people run home excitedly to share the good news with their partners. But if your plans for the money don't include your partner, there's temptation to hide your newfound wealth. Maybe you feel your partner will ask you to cover more expenses around the house, or you might hide a pay increase because you don't want your partner to be jealous or resentful. This can happen if your career is advancing faster than theirs. You may have a valid reason for hiding your higher salary, but the secret can blow up in your face, especially if you file a joint tax return. Maybe you feel obligated to help a family member struggling financially. At the same time, you know your spouse is uncomfortable with giving ongoing support to relatives, particularly those who have a history of being irresponsible with money and repeating mistakes. Giving someone pocket change here and there probably isn't a big deal. But when you start forking over large sums of money to help relatives with expenses, or to bail them out of trouble, this can slowly affect your bottom line. And in all likelihood, your spouse will become suspicious and ask you to explain missing money. You shouldn't let family members dictate your finances, and you definitely shouldn't let their requests drive a wedge in your relationship. Before helping anyone financially, have a talk with your partner. Put yourself in their shoes. How would you feel if your partner regularly gave large sums of money to family without discussing the issue with you? Couples who fight over money have a higher risk of divorce, but this doesn't mean you should hide details about your financial life to avoid a conflict. For every money secret you have, there's a chance your spouse will learn the truth. Keeping a secret for too long can destroy the trust in the relationship, and it can take time to repair the damage. The post Are You Guilty? 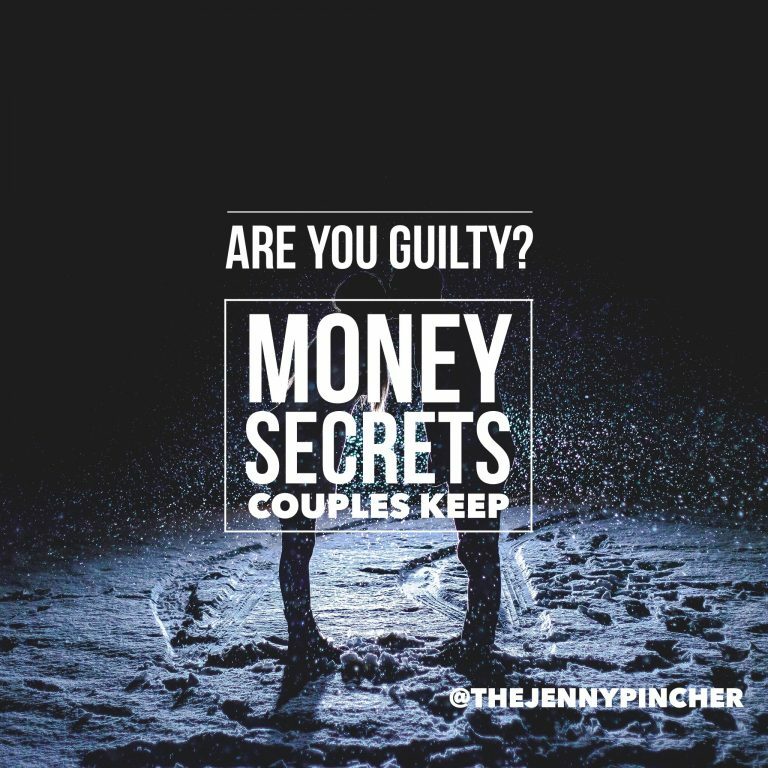 Money Secrets Couples Keep appeared first on The Jenny Pincher.